Mellowing in Moab Before our mad dash for home, we slowed the pace a little to enjoy the town and surroundings of Moab. 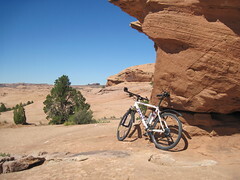 Situated between Arches and Canyonlands NPs, as well as multiple off road venues, the town booms as a recreational hub, but has taken on the tourist destination feel with lots of motels, restaurants and shops. First, we switched motels from the rip off Motel 6 to a plush La Quinta, at a cheaper rate courtesy of a travel coupon. (Thanks for the tip Susan) In the midday, we explored Canyonlands National Park with short hikes to Mesa Arch and Grand View Point. In the afternoon, Esther went shopping while I checked out the world famous Slick Rock Trail. I intended to watch other bikers, but since there was no one there, and I couldn’t embarrass myself, I took my bike on the practice loop. I crawled through the course, stopping to get off once in a while. The trail is marked by white dashes painted on the rock. The scenery was amazing and I fortunately escaped injury. I think I’ll stick with commuting and bike paths for my biking! We enjoyed a late afternoon swim at the motel pool and a good dinner at the crowded Moab Brewery.